Hello there! 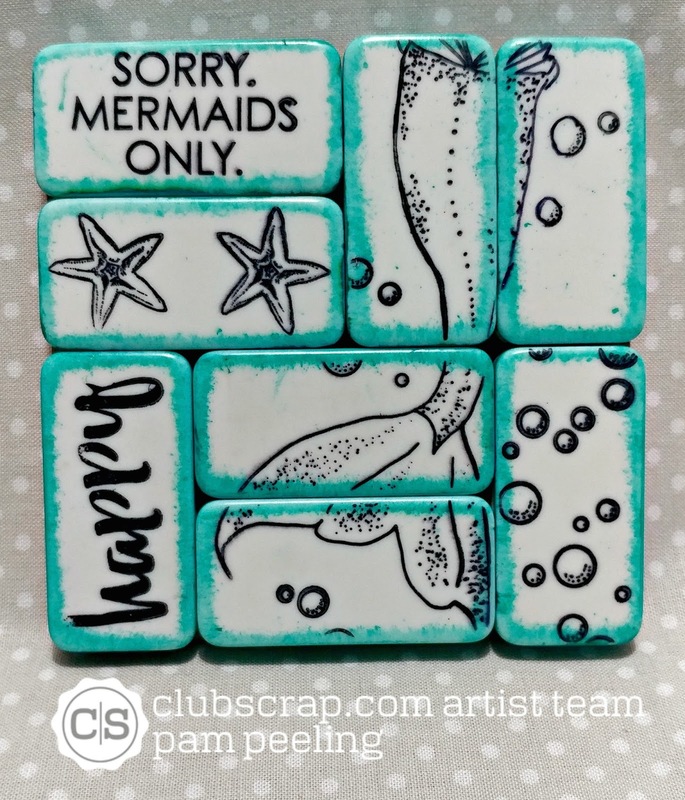 Welcome to the Club Scrap Artist Team Challenge for the beautiful August kit Lagoon! If you just came from Hetty's blog you're in the right spot. 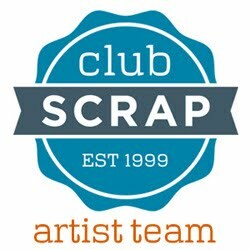 This month we were tasked with recreating a project from the Club Scrap Pinterest page. This was such a fun challenge-there were so many really awesome projects to choose from! I decided to recreate something I found in the "Why didn't I think of that " page. It was part of Grafitti Blog Hop in January 2014 and done by Janet a long time Club Scrap member-check out her original blog post for more details. Here is Janet's original project! She used dominoes and stamped images from a bunch of different Club Scrap kits. I saw it and just loved it! 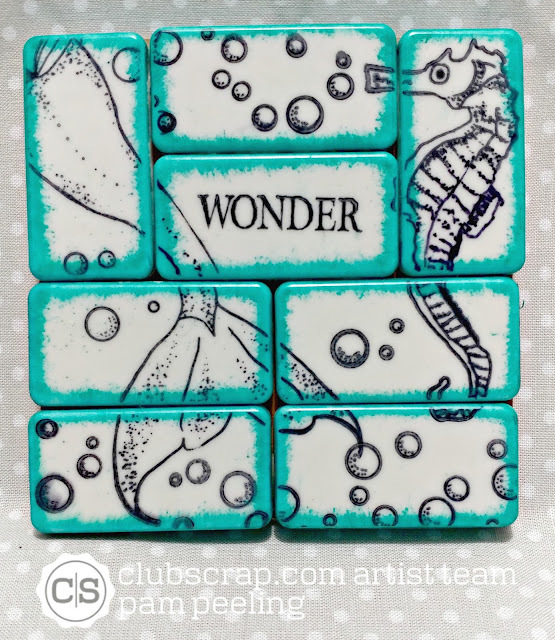 I love reusing something for a different purpose and dominoes have so many possibilities! I decided to make 4 smaller pieces to be used as coasters. 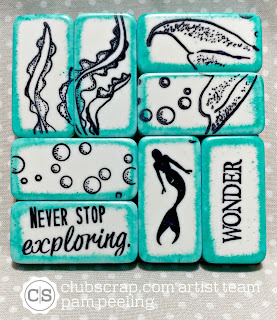 I used mostly stamped images form the Lagoon kit's unmounted rubber stamps but did use a few sentiments from other kits. 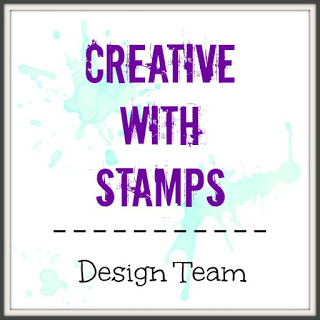 I stamped all the images with black Staz-on ink. Aaaahhhh I love those bubbles! 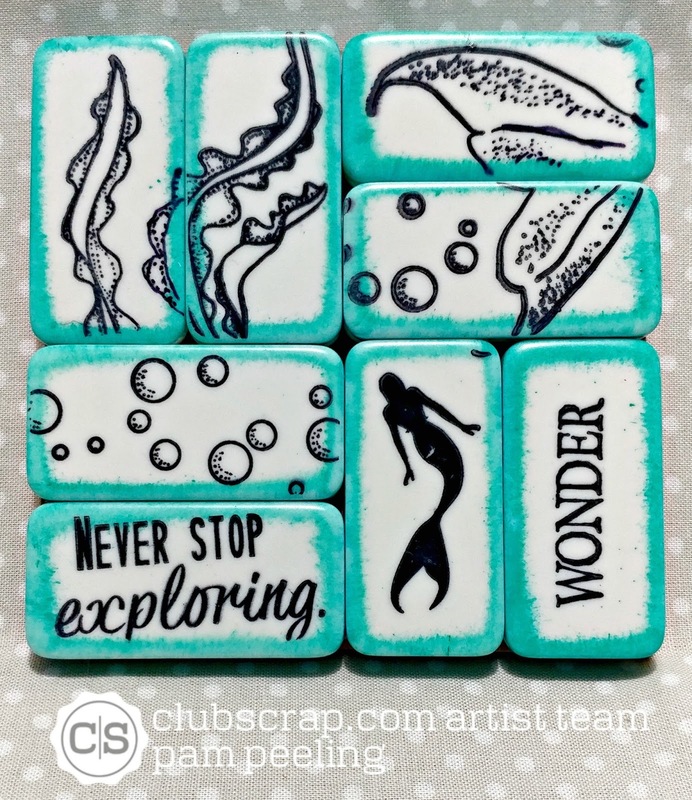 I used alcohol ink and colored the edges of all the dominoes with a dauber. 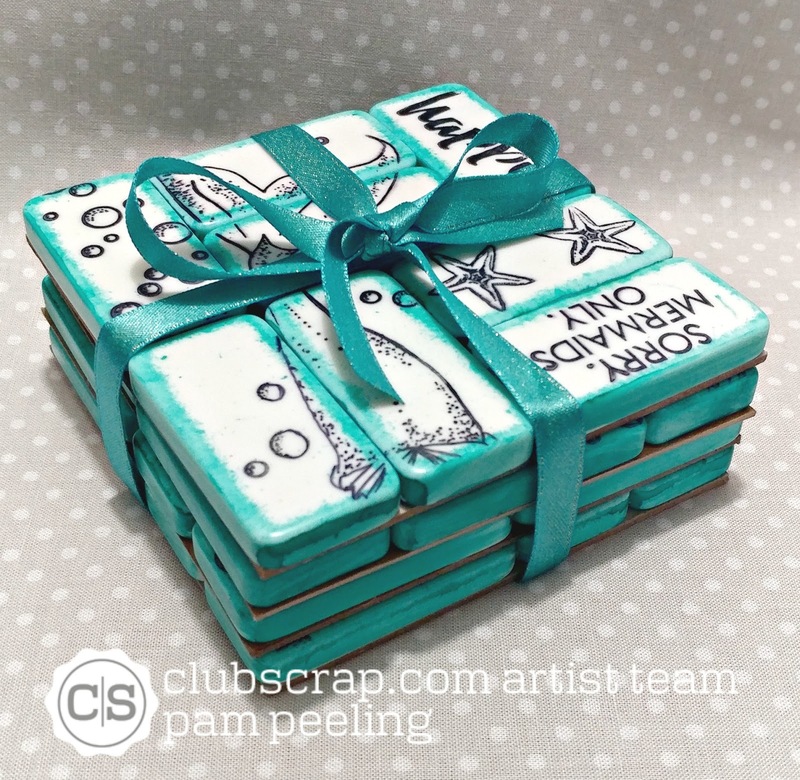 I cut 4 pieces of chipboard 4" square and glued on the finished dominoes. I sprayed the finished pieces with a clear satin finish spray paint to seal. 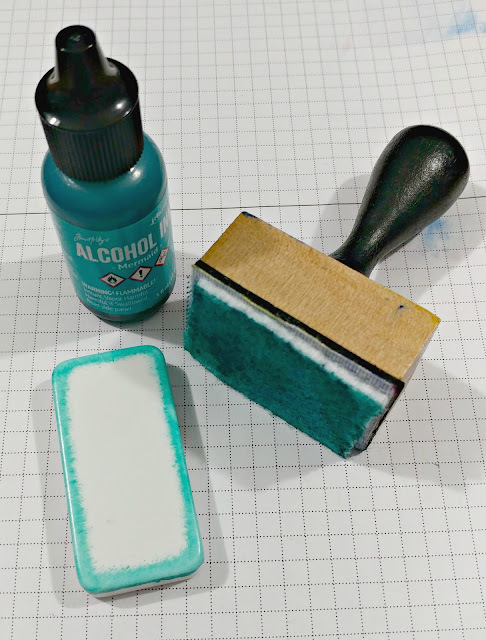 So easy and so fun!!! 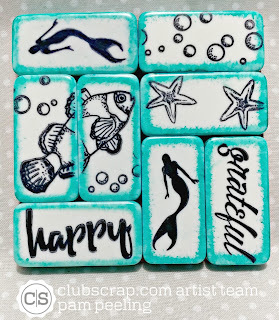 Now head on over to Roni's Blog to see what she made! Wow, Pam, this is totally awesome! What a great pin you picked. Pam what a fun way to switch up the larger domino art and make them on a small scale!! SO CUTE! I LOVE these! They would make a perfect gift. Absolutely breathtaking. These are way too cute to put a drink on! You should get some tiny easels to display them on! Love your version of this project! Wowzers! I really like how to customized the original inspiration piece into practical, usable art. Very clever! OMGOSH I LOVE LOVE LOVE these coasters you made! they are so sweet, and what a neat idea! LOVE IT! I need to try this, thank you for the inspiration! Beautiful! That teal really make them pop!